Now I wasn't really looking for something new to do just yet since I have so many other things to finish. 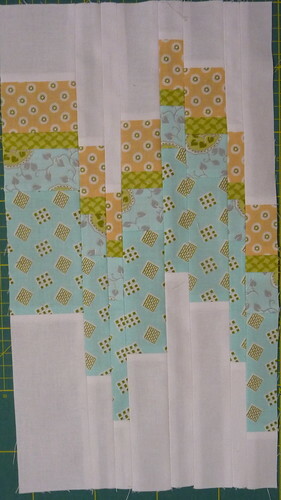 But when I saw this fun looking blog hop called the Something New Sampler QAL at The Cute Life I couldn't resist. There will be 9 different blocks using uncommon techniques over the next four weeks by a variety of bloggers. Information on the schedule and details can be found here. So this week the uncommon technique is the Bargello Block. I have often thought it would be nice to give this pattern a go, but have never got round to it, until now. So here is my modern bargello block. I am not too sure about the colours I have chosen. The two turquoise fabrics blend in a bit too much to each other and I wish the fat section on the left wasn't quite so fat. I am impressed with myself that I have managed to finish this so early in the week. So I can now get back to finishing some other things! But I can't wait to see the next block.